Real Property Management’s informative series on rental home management answers many of your questions about being a landlord and this very important topic, Curb Appeal and Rent Ready. A well-presented house appeals to more renters, meaning it will rent faster and for a higher price. Numerous home renters decide whether to look inside a house based on its curb appeal, which is the view they see when they drive by, arrive for a showing, or see photos online. You can help make sure renters want to come inside your house by spending some time working on the home’s exterior appearance and paying attention to the details. When preparing to rent your house, think about how much money you can spend on the home’s curb appeal, and how much you should spend preparing the interior. Weigh the value of these costs against how much improvement you will actually make. Will a new roof make your home rent faster than a new coat of paint on the front door? Are granite countertops so much better than the original laminate counters? Renters will be impressed by a brand-new roof and marble countertops, but they are not likely to give you enough extra money to pay for it in the long run. There is a big difference between making minor and inexpensive cosmetic touch-ups to your house, such as new carpet in the entryway and a fresh coat of neutral paint in the living room, and doing extensive and costly renovations, like installing a new kitchen. Some factors to consider: When was your home built? Is it time for upgrades/renovations, and to what degree? How does your home compare the home next door? Avoid overspending and over-improving in lesser important areas and under-improving the areas that need a facelift the most. Before putting your house on the market, take the time to maximize its appeal. Get into your car and drive up to your home as if it is the first time; see it through a fresh set of eyes. What immediately attracts you to the home and what bothers you? Is the mailbox leaning? Does the siding need washing? How does it compare to your immediate neighbors? To see your home from a different perspective, make color digital photographs of the home and look for problems. Then, for a more objective look, remove the color from the same photographs and again look for issues. Sometimes problems are easier to see without the distraction of color. Keep the lawn edged, cut, weeded, and watered. Walk the yard to make sure there are no hidden holes or dangerous objects. Walk the fence perimeter to ensure it is sturdy and will not damage a tenant’s belongings or physically injure a tenant. This also applies to decks and railings. Check your drains and downspouts to verify they are secured properly to the home. During spring and summer months, place beautiful potted plants by the entryway. Make spot repairs on cracked or peeling paint on doors and windowsills. Repair any loose walkways, pavers, or driveway concerns. In winter, keep walkways, steps, and driveway cleared of snow. Keep the garage door closed, clean, and lubricated. Move any personal property that is not included in the lease. Remove any clutter, including garden gnomes, plastic pink flamingos, broken sprinklers, and leaky water hoses. Thoroughly clean every room in the house. 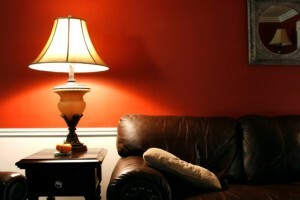 Repaint soiled or strongly colored walls with a neutral shade. Remove pet, food, and smoke odors, which are quick turn-offs for prospective tenants. Ask someone who does not live in the home daily, and who is not accustomed to its smells, to judge the interior scent of your property. Replace window blinds, curtains, and drapes if necessary. If there is a fireplace and chimney, have it professionally inspected, repaired, or closed off. Ensure all smoke detectors and carbon monoxide detectors are functioning and securely installed on walls or ceilings. Repair cracks and damage in sheetrock, wallpaper, paint, and floor tiles. Clean any appliances that are included in the lease. The refrigerator, oven, and dishwasher must appear spotless. Staging is a strategy that works well for enhancing the interior of your home. Leave higher quality furniture, artwork, and floor lamps in the home, especially the living room and dining rooms, to show potential renters how nice the home is. You can rent or borrow furniture for a short term, or you can hire a professional stager if the home commands a high rent. Remind the prospective tenants that none of the furniture is included with the lease. 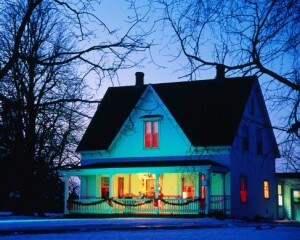 Make your home appealing at night too; some people drive by after work. Add attractive lights and decorative light fixtures to the front of the house. Light up the interior and draw back heavy drapery, but keep sheer curtains down. 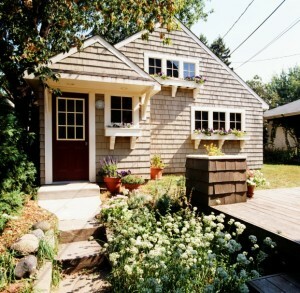 This gives the impression of privacy while still making the house eye-catching. It is very important for your address numbers to be clear from the street during the day and at night. You do not want to miss prospective tenants because they could not find the property. If you can budget for it, fresh paint will bring amazing changes to a dingy house. As you drive around your town, notice color schemes that appeal to you and enhance your style of home. Consider installing an attractive front door. If you cannot justify the cost of a new door, replace the plain doorknob with something more stylish. 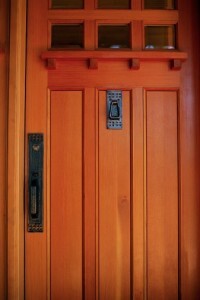 If new hardware is beyond your budget, repaint or restain the door and simply polish the hardware. The trick is to find easy and inexpensive improvements.